A Derby waste site that was the source of fly problems in the city has now been cleared and the enforcement notices have been met. At its peak, the fly infestation caused by excessive waste on site that exceeded permit requirements, caused misery to local residents and even forced the closure of some shops. Before the effects started to be seen by the community, the Environment Agency had already issued a notice to remove specified waste and had prohibited any more waste. As this was not complied with a demand was then made for all waste to be removed from the site. The fly situation has been under control for a while now, but the waste still had to be removed, before the additional restrictions were lifted. We are sorry that local residents had to face the fly problems earlier in the Summer. This is a prime example of why we set permit requirements and why they need to be met. Too much waste on a site especially if it is outside massively increases the risk of this kind of issue. That is why we not only limit the amount of waste but also prescribe what type of waste and how it should be stored. As the owners have now met our requirements the enforcement order no longer stands and as they have planning permission to use the site as a waste facility, they will be allowed to continue to operate as long as they meet the conditions of our permit. 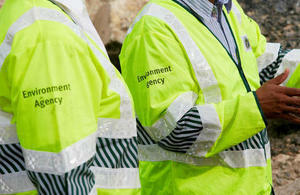 If members of the public are concerned in the future that permit requirements are not being met they should contact the Environment Agency 24hr hotline on 0800 80 70 60.